One of the most iconic and influential songwriters in country music history will finally be receiving the documentary treatment. Without Getting Killed or Caught: The Life and Music of Guy Clark is currently in production and is being helmed by music industry veteran Tamara Saviano as producer, writer, and director. Guy Clark fans will recognize Saviano’s name as the producer of 2011’s This One’s For Him: A Tribute to Guy Clark that went on to win the 2012 Americana Album of the Year. Saviano has also been working with Clark on his definitive biography. Without Getting Killed or Caught gets its name from the iconic song “LA Freeway,” and sets out to profile the man who was the songwriting centerpiece of Outlaw country music in the 70’s both in Texas and Nashville, and still today at 73 is revered by peers and fans. The film starts out with Guy and his soon-to-be wife Susanna Talley pulling into Nashville in their white Volkswagen bus loaded with all their worldly possessions, including a scrap from a burger sack with a partial lyric that reads: “If I could just get off of this L.A. Freeway without getting killed or caught,” and ends with a scene from Guy’s 73rd birthday where Terry Allen, Rodney Crowell, Steve Earle, Ramblin’ Jack Elliott, Joe Ely, Robert Earl Keen and Jerry Jeff Walker sit around and swap stories. In between, the film will include lots of never-before-seen photos and video, and exclusive audio from Guy Clark’s legendary life and career, including many pieces of history from Clark’s private family collection. The remaining parts of the film are set to be shot around Texas, including the Hill Country, Austin, Houston, and other locations in 2015. The film is said to be taking on more of a feature film approach as opposed to a documentary because of the creative approach and script from Tamara Saviano. Without Getting Killed or Caught: The Life and Music of Guy Clark is scheduled to be released in 2016 to coincide with the release of Saviano’s biography of Guy Clark, and Clark’s 75th birthday. Front row: Robert Earl Keen, Ramblin’ Jack Elliott, Guy Clark and Maude the dog. 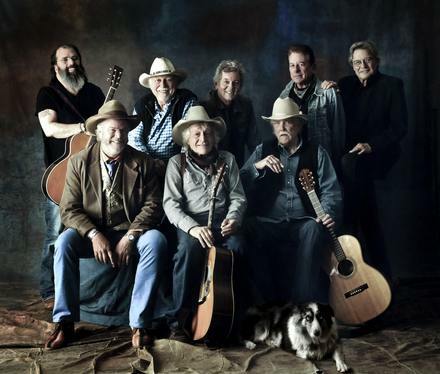 Back row: Steve Earle, Jerry Jeff Walker, Rodney Crowell, Joe Ely and Terry Allen. I am so excited about this this has the potential to be great.If you haven’t seen it the film made about Jerry Jeff Walker “OK Buckaroo’s” Is out and supposed to be really good. I have not seen it yet but the review’s are good. a DVD release is either coming soon or out already.I have seen a movie made in the 90’s about Rambling Jack Elliot called “The Ballad of Rambling Jack” and it was wonderful. Looking forward to Guy’s movie very much. Thank you for posting this. Great choices on the pictures. 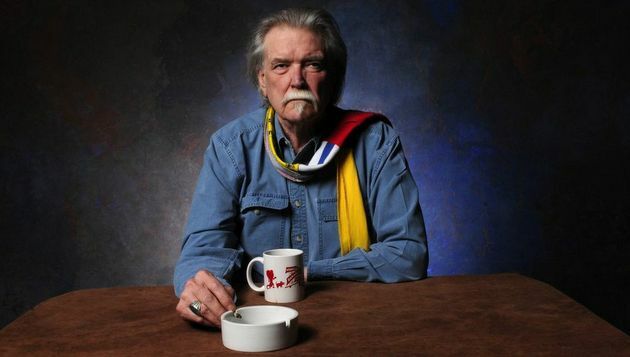 A documentary on Guy Clark is well deserved and overdue. Sweet! Can’t watch to see this, Guy Clark is a legend and one of my favorites!! Had the good fortune to see Guy in concert here about 4-5 years ago . With his songs , his stories , his guitar and another guitarist /accompanist it was one of the most entertaining shows I’ve ever seen . Honesty and warmth oozed from the stage. REAL songs that ran the emotional gamut and had listeners mesmerized throughout the evening . It’s not much but I’m a proud owner of Wade Bowen’s The Given which includes his duet with Guy Clark on “To Live is To Fly” and it’s a very beautiful duet. That is one cool pic. Those folks certainly represent the brain trust of my kind of music. cant wait for this…ive often wondered when someone was gonna do a movie on GUy. I’m so happy to learn of the documentary of Guy’s life and music. He has been the heart of my music for years and years, and a huge influence on both my son and daughter, as they grew up listening to him. He has never received the recognition that his talent and art deserves. My daughter and I saw him at Son’s of Hermann Hall in Dallas in ’89 or ’90, when she was 13. What a thrill. Keep on rolling, Guy. You’re the BEST. I’d like to see someone compile a list of the greatest artists of the past half-century among country singers/writers who were not played on the radio and did not become hitmakers in their own right. I think Clark and Billy Joe Shaver may be the top two, though there could be a lot of dispute regarding such a list. Certainly agree that they are up at the top, but even Guy would tell you that Townes should sit at the top. Guy and all the above are the greats, but my fave dude has always been Steve Fromholz.